(This is the first of two articles on the Mixer Brush that I've written. Having wrestled with Photoshop's new Mixer Brush in CS5 for the past few months, I've come to the conclusion that the new tool is indeed a great addition, however with many caveats. Some of the problems are technical ones (such as painting in 8-bits/channel), others by design (not mixing with transparency). Here are the biggest hurdles I've come across while working with the new Mixer Brush, and how I've overcome them for the time being. This one stumped me for a long time. No matter how intense my color choices, the Mixer Brush always seemed to produce muddy results. The problem lay in the fact that the Mixer Brush wasn't actually painting with the color I had selected in the Color Picker. Not until tackling an unrelated problem did I finally find the solution - the Mixer Brush only works properly in 16-bits/channel. As can be seen in the pic below, the Mixer Brush never manages to build up to the actual color you have selected when painting in 8-bits/channel, no matter how many strokes you lay down. When painting in 16-bits/channel, the Mixer Brush works just fine. So the solution is easy - paint in 16-bits/channel! 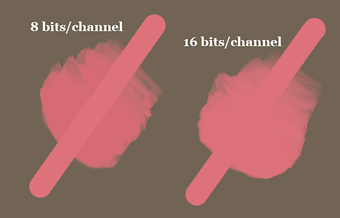 To change any document to 16-bits/channel, select 'Mode>16 Bits/Channel' in the 'Image' menu. You can also set the color depth in the 'New Document' dialog when creating a new document. The only problem with this solution is that not all filters are available when working with 16-bit images, so expect to change the mode occasionally if you like using filters. 2.) Paint in a wide-gamut RGB space or in Lab Color mode. This is an optional but recommended solution to the limited color palette of Photoshop's default sRGB color space. I mention this as an optional solution because the Mixer Brush, like real oil paint, can sometimes produce muddy results. Being able to pick more intense and saturated colors can help alleviate this problem. I'm hesitant to discuss this issue too deeply however as it would require an explanation of color management, which is a headache for anyone. Suffice it to say, even Adobe recommends working in Adobe RGB at the least. If you do decide to try working in a wide-gamut RGB, or in Lab mode, don't forget to convert back to sRGB if you plan on displaying your image on the web. 3.) Use 'Copy/Paste Merged' instead of 'Sample All Layers'. The 'Sample All Layers' feature of the Mixer Brush allows you to blend colors on a new layer, preserving color information on other layers. Unfortunately, this feature also tends to slow down brush interaction dramatically. If you wish to 'Copy/Paste Merged' only certain areas of an image, you can select an area with the marquee tools and then manually select 'Copy Merged' and 'Paste' from the 'Edit' menu. 4.) Using Layer Blend modes and blending with Transparency. One of the major drawbacks of Photoshop's new Mixer Brush is that it doesn't blend with transparency, making the process of painting on layers a bit of a hassle. Instead, Adobe opted for the 'Sample All Layers' feature discussed above. 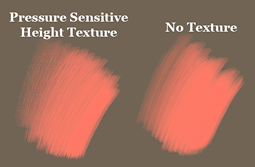 However, the Mixer Brush can fake blending with transparency just fine using most layer blend modes, provided the layer is filled with the appropriate 'neutral' color. A 'neutral' color is any color which appears transparent when using a certain blend mode. 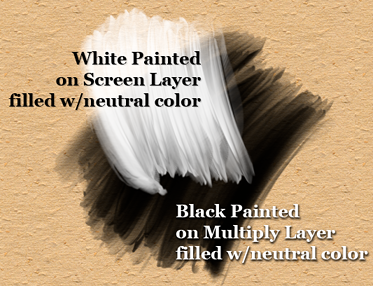 Most layer blend modes have an associated neutral color, which (when filled with that color) will blend with the Mixer Brush as if the brush were blending with transparency. To easily fill a new layer with a neutral color appropriate to it's blend mode, hold 'Alt' while pressing the 'New Layer' button in the Layers Palette. In the 'New Layer' dialog, select a blend mode. If that blend mode has a neutral color, the option to fill the layer with that color will become active. Simply select the option to fill the layer and then click 'OK'. I find that using Actions to create layers with blend modes I use often can save a lot of time. You can also fill the layer with it's neutral color, color code the layer, and name the layer all in one action (such as creating a blue layer named 'Multiply Layer'). 5.) Set a shortcut key for Loading/Unloading Color. The Mixer Brush also makes a great blending brush. Normally, to turn the Mixer Brush into a straight blending brush you have to toggle off the 'Auto-Load' button in the Tool Options Bar. 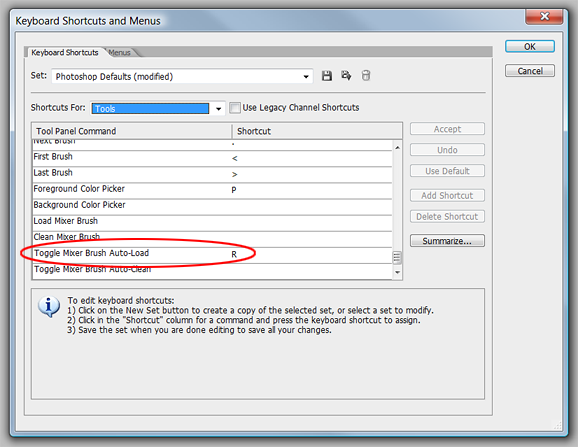 However, a shortcut key can be assigned to make the task quicker. Now the Mixer Brush can be toggled from a paintbrush to a blending brush simply by pressing that key. 6.) 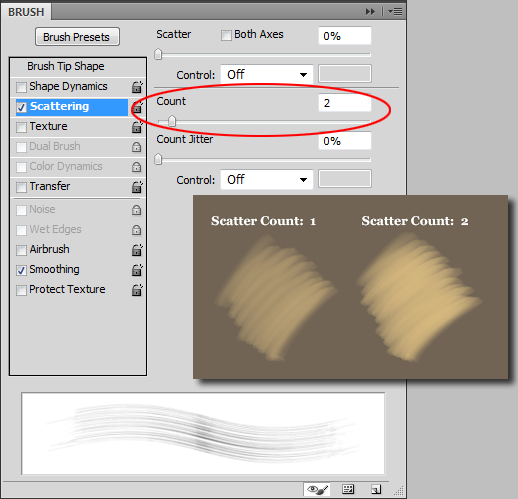 Use Scatter Count settings to strengthen Bristle Brushes. The new Bristle Brushes in CS5 are a great addition, expecially if you have a Wacom tablet and a rotation-sensitive Art Pen. Adjusting them for use with the Mixer Brush can be tricky however, especially if you want a bolder stroke without too much bristle thickness. One way I've found to increase brush opacity (while keeping bristle thickness to a minimum) is to increase the Scatter Count of the brush. A Count setting higher than '2', though, might slow down your brush's interaction, so be careful when using this option. 7.) The Wetness slider works better with Non-Bristle Brushes. Although the new Bristle Brushes in CS5 work fairly well with the new Mixer Brush, I've found that the Wetness property of the Mixer Brush works far better with normal brush types. At low settings, the Wetness slider still has a very wet effect with many Bristle Brush settings. For this reason, it's still worth your time to try using the Mixer Brush with regular brush types if you want a subtler blending effect. 8.) Height Textures can add greater pressure-sensitivity. While the Mixer Brush lacks an opacity setting, experimenting with Height Textures can add a great deal more subtlety to your strokes. 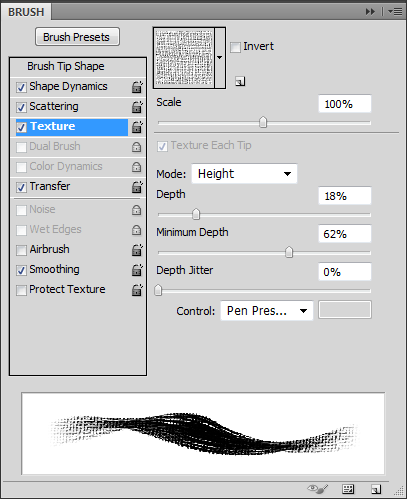 By setting the Brush Texture mode to 'Height' and the 'Depth Jitter Control' to 'Pen Pressure', you can simulate how real paint interacts with the grain of your canvas; the heavier the stroke, the greater the penetration. Using very low 'Depth' settings, you can effectively simulate drybrushing. And by inverting the texture, you can simulate thin paint puddling into the grain of the canvas. The only problems I've found with adding a Height Texture to a brush are a slight performance hit, and the fact that the settings seem to vary their effect slightly if you change the brush's original size by a large amount. 9.) Using a Round Brush with the Mixer Brush. If you prefer using round brushes for your painting, then you've probably noticed that they don't work very well with the new Mixer Brush. I've found that certain brush settings and brush presets can help alleviate the problem, however. The real problem, though, has to do with the default round brush's Tip Shape. 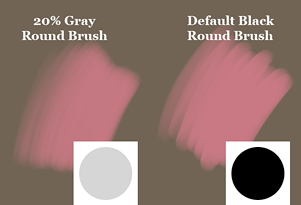 The default round brush has a completely black Tip Shape, meaning you'll have a hard time laying down light strokes since the Mixer Brush has no opacity setting. You could lower the Flow setting but I've found this can produce undesirable color shifts and doesn't allow you to mix to full color in a single stroke. Of course, the downside to this method is that you won't be able to change brush hardness unless you make several versions at various levels of hardness, since only the default Photoshop round brush can change hardness using a slider. Though I've had a heck of a time making the new Mixer Brush in Photoshop CS5 work for me, I feel that I've successfully tackled most of the issues which plagued me at the start. Hopefully, Adobe will address many of these issues in the next version of Photoshop, especially the ones dealing with transparency, color depth, and bristle brush wetness. 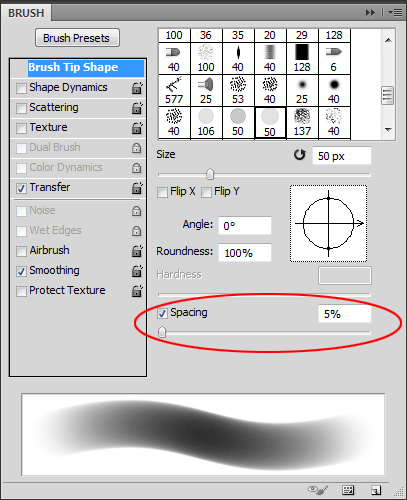 For more tips on using the Mixer Brush, see my follow-up article: More CS5 Mixer Brush Tips. p.s. Eventually, I plan to make some of the brushes I've made with the Mixer Brush available for download. I just need to find a suitable (and preferably free) webhost first. For those interested, John Derry has a set available for purchase. Thank you for taking the time to analyze the Mixer Brush. The slowdown from sample all layers was driving me crazy, and and your workaround sounds great, I'm going to try right now. Also, hadn't considered painting in 16bit mode. NICE. Glad the article was helpful. :) I should have also mentioned that the 'Copy/Paste Merged' shortcut only seems to work if more than one layer is present. Just duplicate the layer if you're working with a single layer. One bit you might want to add for #5 (Set a shortcut key for Loading/Unloading Color) is that in order for your shortcut to work, the Wetness value must be greater than 0% (even 1% will work). Without any Wetness, the Mixer Brush will not blend. Another way to deal with switching between Dry/Wet brushes is to use the "0" (zero) key. 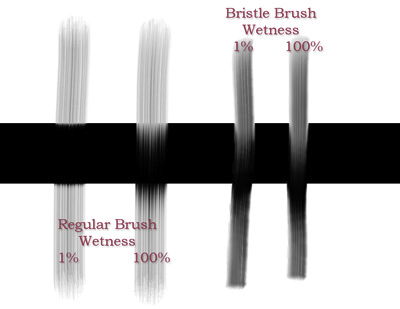 Clicking once will change the Wet Value to !00%—a blending brush; doubling-clicking the "0" key will toggle the Wetness Value back to 0%—a dry, non-blending brush. Your observations of CS5's new painting features have been very helpful since before the release. I'm very happy to welcome your insights here! I'm not familiar with the Gimp Mixbrush but the Mixer Brush in Photoshop is faster than Photoshop's Smudge Tool on my system. Large brush sizes can definitely slow down the Mixer Brush though. I've also read that some people with AMD machines encounter lag. Your best bet is to simply download the free trial from Adobe's website. Good stuff. The Mixer Brush is a good tool but its hard to figure out. Your #9 tip solved m problem of too much mixing when I was trying to get a soft blend. your tutorial is brilliant - to the point, comprehensive, well written. Thanks. Thanks for sharing the photoshop color info here. Keep up the good work. All the best.